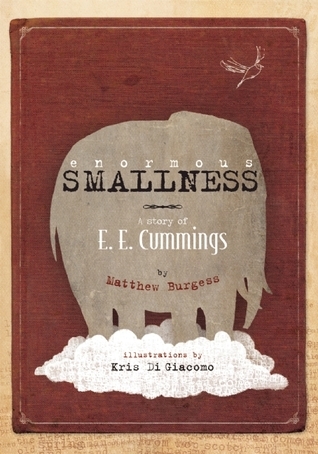 Enormous Smallness: A Story of E.E. Cummings by Matthew Burgess, illustrated by Kris Di Giacomo. Grades 3 and up. Enchanted Lion Books, April 2015. Unpaged. Review copy provided by my local library. Booktalk: When you look out your window, what do you see? When E.E. Cummings looked out his window, he saw all the small things that make up our beautiful world. He saw them and he noticed them and he wrote about them in ways that no one had ever written before. His mother started writing down the poems he came up with in a book that she called "Estlin's Original Poems." As E.E. grew up and wrote more and more poems, he wanted to write in NEW ways. He played around with punctuation, he used lowercase letters where he should have used capitals. E.E. "wanted his reader's eyes to be on tiptoes". Some people thought it was too strange, but some people thought it was wonderful. This is a book for lovers of words. This spry little book will find a good home in poetry units for kids of all ages. I bet every kid who reads e.e. cummings is curious about what the e's stand for and why they're small. This book illuminates the life of a famous American poet. The illustrations pair very nicely with the text, featuring natural tones in browns and greens to reflect E.E. 's love of the outside world. Text is incorporated into the mixed-media illustrations for subtle effects that are reminiscent of the world of Melissa Sweet (one of my favorite illustrators!). A blue oceanic map is cut into ocean waves as E.E. sets off for France during WWI. Stamped text shows up in tree branches and puddles, evoking how E.E. saw poems in everything around him. The poems chosen as examples represent different styles and illustrate how E.E. 's poems were different from many other poets. They definitely keep the reader's eyes "on tiptoe" and will inspire kids who dig it to seek out more. A timeline includes significant dates in E.E. 's life. Jump Back, Paul: The Life and Poems of Paul Laurence Dunbar by Sally Derby, illustrated by Sean Qualls. The Right Word: Roget and His Thesaurus by Jennifer Bryant, illustrated by Melissa Sweet. A River of Words: The Story of William Carlos Williams by Jennifer Bryant, illustrated by Melissa Sweet.